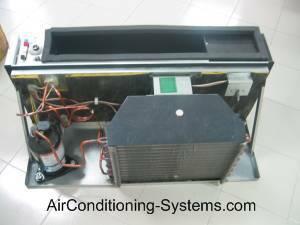 Packaged terminal air conditioner is a self-contained air conditioner system that is commonly used in motels, apartments and smaller buildings in North America. It is mounted on the wall or window with ventilation option that brings fresh air from outside of the building and is individually controlled. In other parts of the world, its similar counterpart is often known as window air conditioner. The standard size of 42" Wide X 16" High X 13 3/4" deep is the common dimension that manufacturers have designed their units to fit the many replacement market in the United States. The common cooling capacity that you can choose from usually range from 7,000 to 15,000 BTUH. It has an evaporator coil that faces the space to be cooled and a condensing coil that is mounted facing the outside of the building. A two speed or three speed fan is used to discharge the cool air to the room. The internal view of the components that made up the self-contained packaged terminal air conditioner unit. Notice the compressor and the condensing coil at one side and the control at the other side. Some units come with the heat pump version which is usually known as PTHP or Packaged Terminal Heat Pump. In this case, the same unit that is being used for cooling during warm weather is now being used for heating during cool weather. The heating cycle is known as reverse cycle where a 4 Way Valve is used to reverse the flow of the refrigerant. Other units come with an auxiliary heater as a supplement to the heating process in the event that the heating capacity is not enough during winter. There are also options for heating units using hydronic or electric heater. The older units usually use mechanical control with mechanical push buttons to select the mode of operation and fan speed control. Another rotary knob is used to set the desired temperature of the unit. This was the most cost effective and simplest method of control in the past. Timer Control where you will be able to set when to ON or OFF the unit. Mode control is operated by pushing the same button to select the mode of operation. Temperature setting is displayed by the use of 7 segment display and buttons used to change the settings. Energy saving feature such as sleep or economizer function where the set temperature will be automatically adjusted according to the duration that has elapsed. 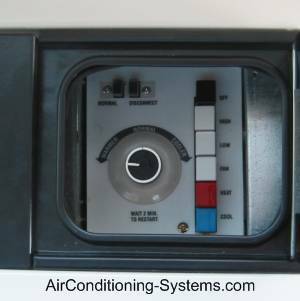 The typical simple mechanical control that is used in older Packaged Terminal Air Conditioner units. Newer units have electronic control option that have more feature such as energy saving mode and 7 segment display. Some manufacturers may have more complicated control system that is able to link up all the units and control them at a central control on top of the individual control that are available at each of the unit. The central controller may be in the form of a personal computer or a touch panel. In selecting the BTUH of the PTAC, a typical rule of thumb is to measure the length and width of the room. Multiply them together and match it to the recommended chart listed below. As an example, if the length of your room is 20 feet and the width is 15 feet, you will get a 20 X 15 square feet which is equal to 300 square feet. The BTUH needed based on this formula is 8000 BTUH.